Of course with Easter right around the corner, I have seen a lot of ideas on blogs and websites for healthier or entirely food-free Easter gifts for food allergic children, but I must say that one of the first things that comes to my mind when I think of Easter treats is chocolate. No bunny ever gave carrot sticks or toys in my family! It has always been about the chocolate. Even more so than Halloween, it was the one time a year I could devour what seemed like 5 pounds of the sweet stuff in one day. I like to think that I have grown into a chocolate connoisseur (ok, choco-holic in reality). Last Easter, our daughter was too young to enjoy Easter treats but this year, things have changed. 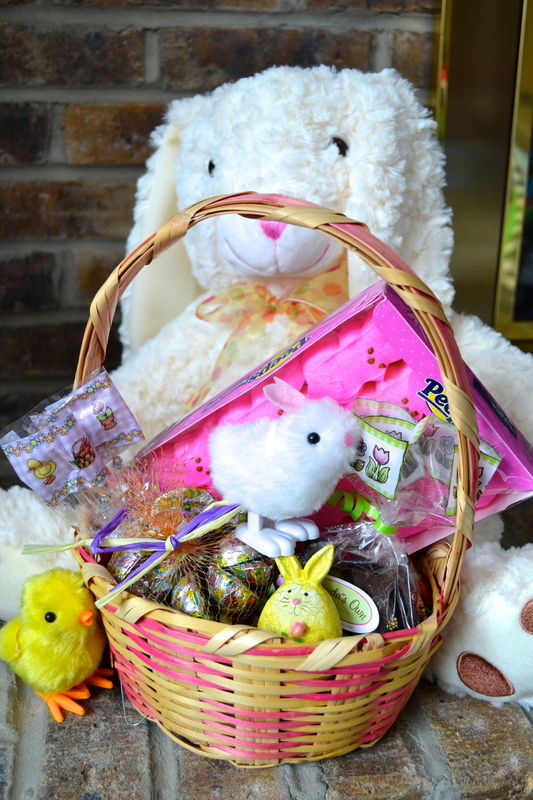 She recognizes the Easter bunny, asks when he is going to visit, and has her basket ready to go. Of course it should come as no surprise that chocolates and desserts of all kinds are notorious for cross-contamination with both peanuts and tree nuts. That should be a game changer for us, but this nut-free momma is not gonna let it get in her way! Her basket will be filled with Vermont Nut Free crispy milk chocolate eggs, Amanda's Own springtime bunny bags and Peeps. Just a note - Amanda's Own is great for people with other food allergies as well. All of their chocolate is nut-free, dairy-free, egg-free and gluten-free! Of course I had to taste test all of the chocolate since it was the first time I had ordered from both companies and honestly, they were great! The fact that I don't have to sweat it when my sweet girl devours it gives me such peace of mind! Planning in advance and taking the time to special order these chocolates versus trying to find something safe at the local grocery store was totally worth it and I will definitely be ordering from both companies again. I am so glad we will (safely) be keeping our sweet Easter chocolate tradition with the girls. We are ready for the nut-free Easter bunny to arrive! Posted on March 26, 2013 by Kristen Rutter and filed under Holidays, Product Reviews.